1. After the agreement was signed, soldiers from both sides gathered at the McLean home to renew friendships and reunite with families. 2. The terms of peace were kind. The message was that the nation could now rebuild as one – not one of revenge. 3. Thomas Tibbs owned a farm near Appomatox Court House. He fought his last battle on his own property. 4. 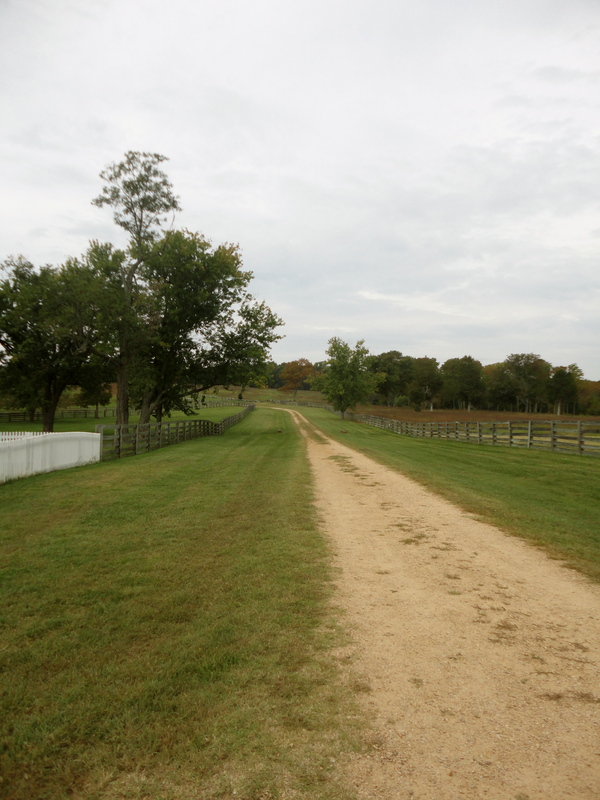 Lee and Grant met one more time after leaving Appomattox. When Grant was president, he invited Lee to visit the White House and Lee came. 5. 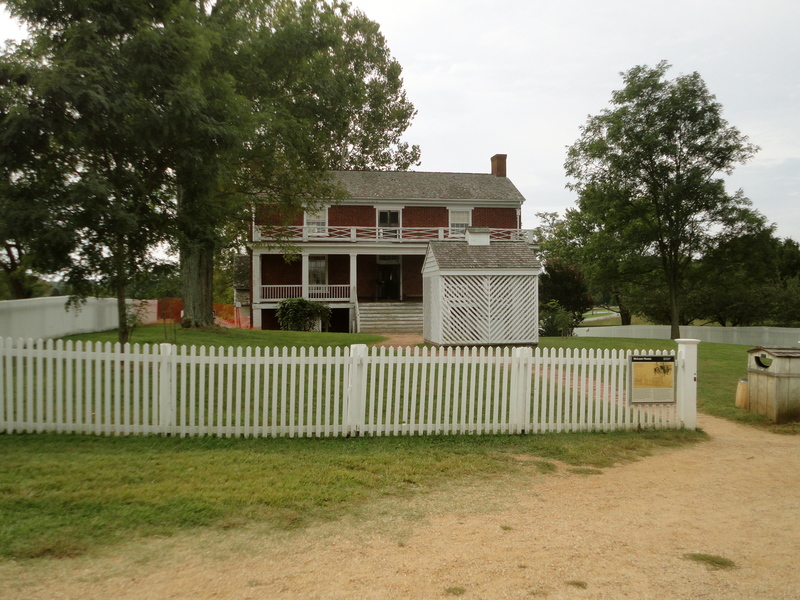 The oldest building at Appomattox is the Clover Hill Tavern (1819). You can go inside – which we did. 7. Custer (yes, THAT Custer) received the flag of truce at Appomattox. 9. 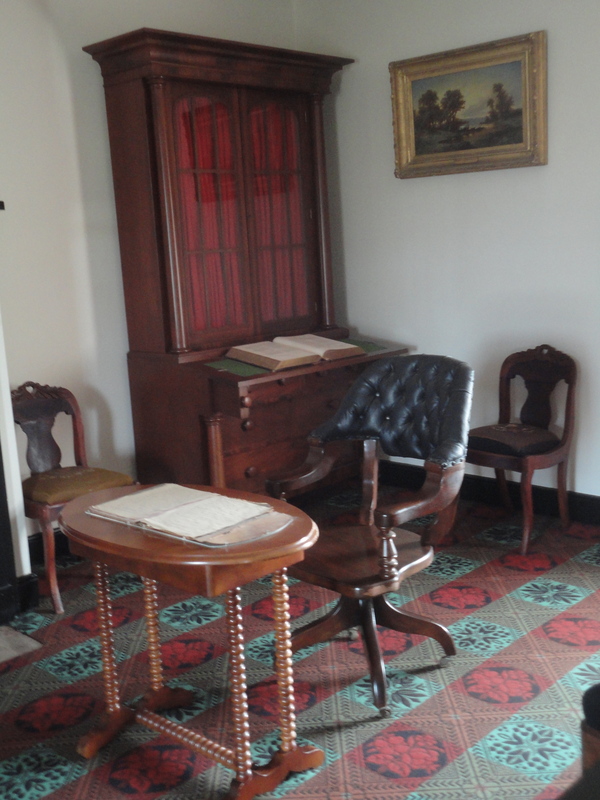 Appomattox Court House was originally named Clover Hill after the tavern. This was a stop on the road between Lynchburg and Richmond. 10. Not all the regiments got the message that the war was over and many still fought for several weeks. In actuality, the Confederates won the last battle of the war. 11. Lula McLean (7 year old daughter of Wilmer) had been playing with her doll in the parlor before the excitement. When the agreement was signed, one of the soldiers picked up the doll and started tossing it around to the other soldiers. The men called it the silent witness. One of the men (Captain Moore) took the doll home with him as a souvenir and the family actually kept it for more than a century, recognizing it’s importance. (Most everything in the parlor was taken as souvenirs.) Lula never saw her doll again, but the doll was donated back to the park in 1992. 12. One of the members of Grant’s staff present for the signing was Lincoln’s son, Robert. As Lee’s aides were looking around for a place for the Grant/Lee meeting they happened upon a resident of the town: Wilmer McLean who was working in his yard. They asked Mr. McLean if he knew of a good place for an important meeting and he led them to a small, uninhabited, unfurnished structure. When they told Mr. McLean the structure wouldn’t work – he said they could use the parlor of his home. When seeing that the home was well-furnished and comfortable, they agreed and went to find Lee to tell him a place had been found. But let’s backtrack here. There is an interesting twist to the story. 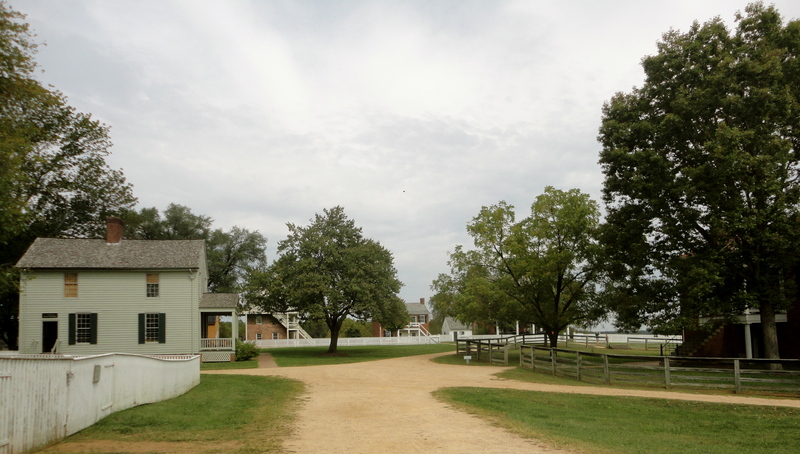 Back in July of 1861, about 120 miles south of Appomattox, the McLean family owned a plantation in the town of Manassas, Virginia. The conflict between the states was escalating and Mr. McLean, offered his home to General P. G. T. Beauregard as headquarters. A cannonball was fired at the house. The ball went down the fireplace and as Beauregard himself wrote, “A comical effect of this artillery fight was the destruction of the dinner of myself and staff by a Federal shell that fell into the fireplace of my HQ at the McLean House.” This was the First Battle of Bull Run (one of the first Civil War battles) and it took place on McLean’s farm – yes, the very same man. Mr. McLean, a grocer by trade, decided to protect his family and moved them north to Appomattox County. And now the final agreement would be signed in his house. Giving Mr.McLean the distinction of having the Civil War start in his front yard and end in his parlor. The war had been ugly. The war divided a nation, friends and family. The war was unthinkable. Lee did not offer his sword (as was customary) and Grant did not ask for it. 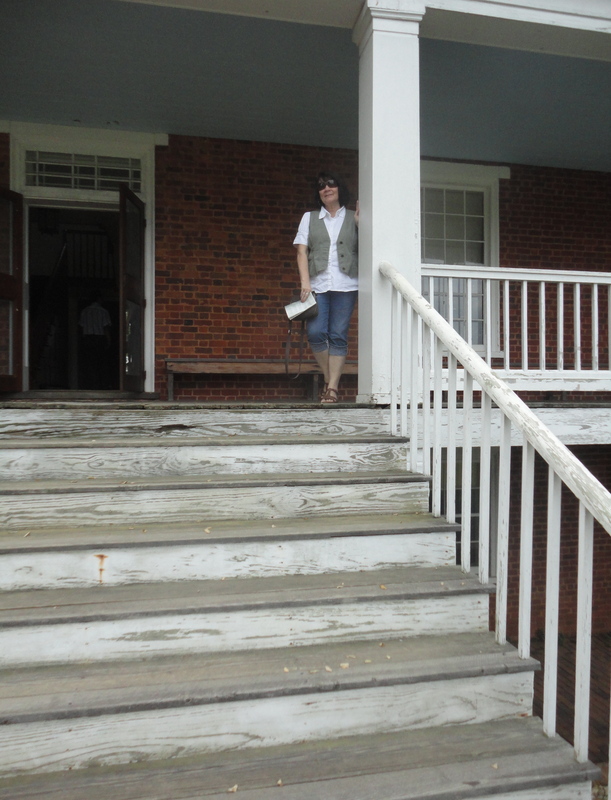 I stand on the steps of the McLean House and ponder the events that happened within the walls. 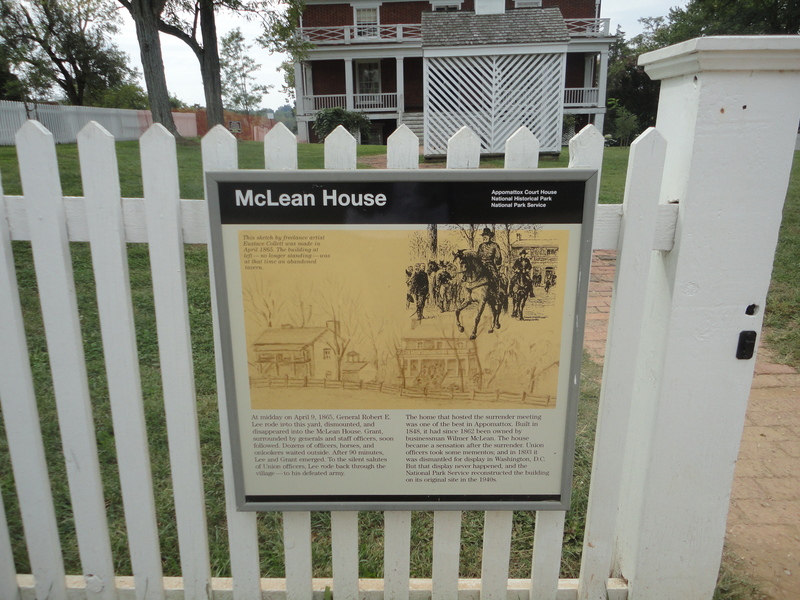 Although some of the buildings in the historic site are original – McLean’s house is not. It was taken down to move it somewhere else and then reconstructed. The road in front of the house. Can’t you imagine Grant riding out of the woods? 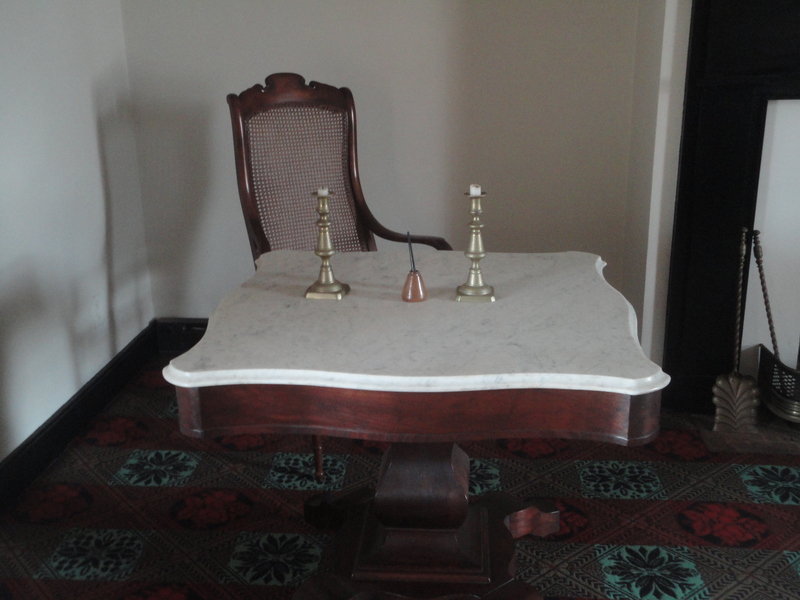 The table where in the agreement was signed – actually a replica of the table where the agreement was signed. Lee sat here.